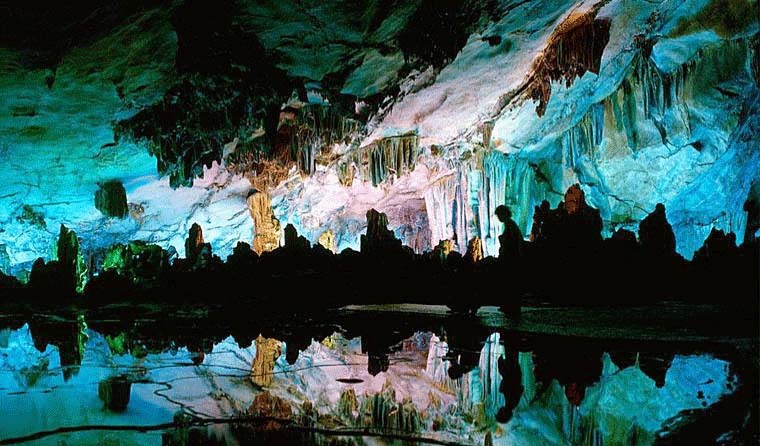 With its location five kilometers northwest of the downtown of Guilin, the Reed Flute Cave is a brilliant cave marked on almost all travel itineraries. The cave got its name from the verdant reeds growing outside it, with which people make flutes. Inside this water-eroded cave is a spectacular world of various stalactites, stone pillars and rock formations created by carbonate deposition. Illuminated by colored lighting, the fantastic spectacle is found in many variations along this 240-meter-long cave. Walking through the serried stone pillars, tourists feast their eyes on changing spots, feeling they are in a paradise of fairy tales.